New York, Dec 1 (IANS) The US government has announced plans to change the H1-B visa program to give preference to workers with advanced American degrees, a move which could potentially have the effect of reducing visas for those educated elsewhere. The US Department of Homeland Security (DHS) said on Friday that the proposed changes would be “introducing a more meritorious selection of beneficiaries” and “help ensure that H-1B visas are awarded to the most-skilled or highest-paid petition beneficiaries” under President Donald Trump’s “Buy American, Hire American” executive order. H1-Bs are non-immigrant work visas given to professionals and those with special skills. According to the US government, 75.6 per cent of H1-B visas approved last year went to Indians. 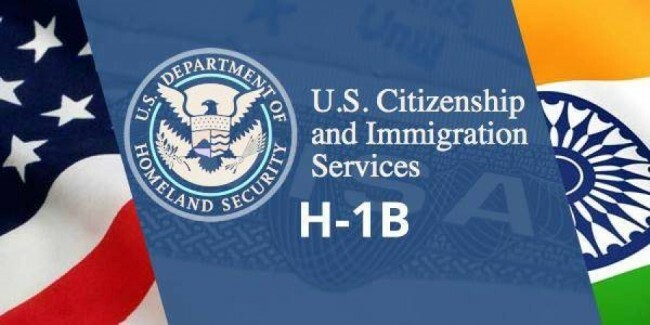 The DHS said the US Immigration and Customs Service (USCIS), which manages immigration, would reverse the current order in which the applicants for H1-B visas are first selected through a lottery for those visas meant for workers with Masters’s and PhD degrees from US universities and then for those open to all. Under the system approved by Congress, 65,000 H1-B visas are available to all who qualify and another 20,000 are reserved for those with advanced US degrees. Since there are a far bigger number of applicants than there are H1-B visa slots, the government holds a lottery to pick the candidates for the visas. Explaining the changes, an immigration expert, Doug Rand, said that under the current lottery process, the USCIS randomly selects 20,000 from among advanced degree-holders and then puts the remainder into the larger pool and randomly picks the other 65,000. Under the new proposal, he said, USCIS would first put everyone in the same pool and select for the 65,000 visas open to all and then move all the unselected US advanced degree-holders into the pool reserved for them and randomly pick the other 20,000. The DHS said this move would have the effect of “likely increasing the number of beneficiaries with a master’s or higher degree from a US institution of higher education”. In reality the changes may not result in a “huge change” because the USCIS predicts that switching the order of the H-1B lottery would result in about 3 per cent more of these visas going to US advanced degree-holders, compared with the current system, said Rand, who is the co-founder of Boundless Immigration, a technology company that helps with navigating the immigration process. There is a large pool of Indians studying in the US who would qualify for the proposed preferential treatment. According to a recent report by the State Department and the Institute of International Education, 95,651 Indians are now studying for advanced degrees in the US and 75,390 are in practical training programmes after graduation. The planned changes would also require companies to first electronically register their applications with USCIS rather than send in completed applications before the selections are made. The visa petition documents of those selected would then have to be sent to the USCIS for scrutiny. The changes will not come into effect immediately. Rand said that his company’s research shows that it typically takes over a year for a proposed immigration regulation to go into effect. Rand, who was previously the assistant director for entrepreneurship in President Barack Obama’s White House and worked on immigration policy, said the switch to electronic registration was proposed because the USCIS wants to “address potential issues of ‘flooding the system’ with non-meritorious registrations”. He said that it was “a criticism that has often been levelled against Indian outsourcing companies” and warned that “all companies will need to take care to follow the new registration requirements to avoid being penalised for ‘gaming the system'”. Rand said that the proposed changes do not impact H-4 visa work permits for spouses of H-1B workers or redefine “specialty occupations” as those fall under two separate regulations that will likely be proposed in the coming months. He added that he expected the DHS to propose to revisions to the definition of specialty occupation “to increase focus on obtaining the best and the brightest foreign nationals” and also make “additional requirements designed to ensure employers pay appropriate wages to H-1B visa holders”.